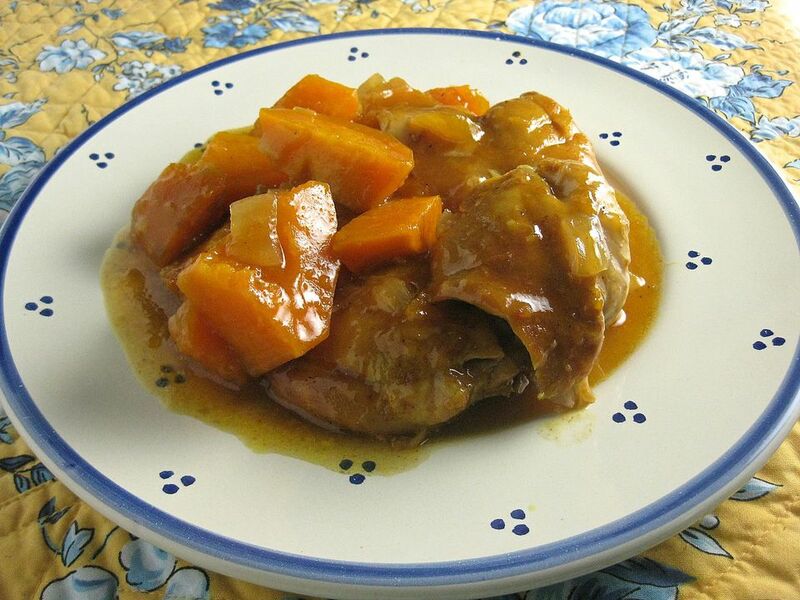 This wonderful and easy recipe for Crockpot chicken and sweet potato is so good for you! One serving supplies 100 percent of the Vitamin A you need every day. And it's delicious too. You can vary the spices in this recipe; add more curry powder, use more ginger or add some freshly grated ginger root, or add some basil or thyme. Remember that recipes like these are quite tolerant. That means you can fiddle with them and they will still be delicious. You could use chicken breasts in this recipe; just reduce the cooking time to about 5 hours on low. Make sure that the chicken is at 160 F on a meat thermometer and that the sweet potatoes are tender when pierced with a fork. You could also add more ingredients to this easy recipe. Think about adding some baby carrots or sliced regular carrots. Other types of potatoes would be good in this dish too; some cubed Yukon Gold potatoes would add wonderful flavor and interest. Because the sauce is so good, serve this over hot cooked rice or pasta. Add a crisp green salad tossed with sliced mushrooms and grape or cherry tomatoes, and some toasted garlic bread. For dessert, an ice cream pie or some brownies would be delicious. Sprinkle the chicken with salt, cayenne pepper, paprika, curry powder, and ginger. Rub the spices into the chicken. Top with the peach preserves, vinegar, and soy sauce. Cover the slow cooker and cook on low for 6 to 8 hours or until the chicken is thoroughly cooked to 160 F (test it with a meat thermometer) and the sweet potatoes are tender when pierced with a fork. Combine the chicken broth and cornstarch in a small bowl and mix well with a wire whisk until smooth. Add this mixture to the slow cooker and stir gently to combine. Cover the slow cooker again and cook on high for 10 to 15 minutes or until the sauce is thickened. Serve immediately over hot cooked rice, couscous, or pasta.